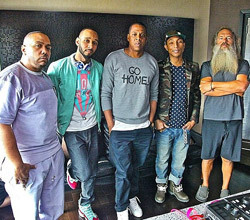 Jay-Z posing with Producers from his music project, Magna Carta Holy Grail. The album releases on July 7, 2013. If you were looking at last nights, Game 5 of the 2013 NBA Finals between the Miami Heat and the San Antonio Spurs, you may have noticed a three-minute commercial that supports the new partnership between Hip-Hop Mogul/Entrepreneur, Jay-Z and electronics giant, Samsung. Over the past couple of hours, I have heard and read chatter on opinions of the piece; but you have to admit, this promotional campaign’s launch is a success. No matter your thoughts, the campaign illustrates three points every great promotion needs….team work, addressing customers’ needs and creating a lot of buzz. Team Work is the foundation of this entire campaign. Yes, we do live in a high-speed interactive world. Yes, consumer’s want gratification. So, what’s new? Glad you asked; I would be happy to tell you. Consumer’s need for gratification has increased significantly; they want more FREE stuff and they want fast and accurate information. And that is exactly what this promotional campaign easily delivers to customers…FREE Stuff and Content. Freebies – Jay-Z’s forthcoming musical project, “Magna Carta Holy Grail,” scheduled for release on July 7th will be giving to the first 1,000,000 Samsung customers who claim the freebie via their Samsung Galaxy S3, Galaxy S4 or Galaxy Note II Tablet. Fans will be able to download their freebie on their Samsung devices on July 4th, three days before the official release date. FREE stuff is huge for anybody; just image how big it is for the diverse hip-hop community or Jay-Z fan. Content/Information – integrating the download app and campaign website, fans can view behind-the-scene content about the making, inspiration and theme of Hov’s musical project. This is just has huge as a freebie. This point is probably an understatement for this campaign. Just place MagnaCarta, Jay-Z or Samsung in your search engine. Every broadcast outlet, print media and blogger imaginable is talking about this campaign; not to mention, the social media chatter… simple & quietly stated, this campaign is viral! This campaign was launched during Game 5’s halftime show. Official viewership numbers have not been released yet, but over 18,000,000 household watched last year’s Game 5. I’m sure this year’s numbers will be similar since Miami is trying to RE-PEAT as NBA Champs. The BUZZ on this promotion; like it or not, is enormous. And in the end, that is what you want to accomplish with your promotions…enthusiastic fans and great buzz. You may not be able to obtain the high profile partnership and you may not have the financial resources to advertise during the NBA Finals; but that is ok, you work with what you got…. The rest is all in the planning, execution and delivery of your campaign.